View of the medieval bridge at Cromford village in Derbyshire. 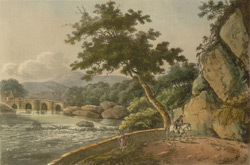 The bridge was erected in the 15th century (like Matlock Bridge) and has three arches. It is near St Mary's Church and has a ruined 15th century chapel nearby. Cromford was of interest to late 18th century visitors on account of its industrialisation by Richard Arkwright who founded the first successful water powered cotton spinning mill here in 1771 and went on to build several other mills in the area.